On Sunday, Owen and I picked up my grandmother and told her we were going to an Ethiopian restaurant. She seemed unclear about exactly what cuisine we were talking about. "Indian food?" she asked. 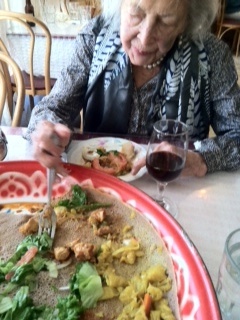 When we got to the restaurant she looked around at the people and said, "Oh, this is an Abyssinian restaurant." I said, "No, no, Ethiopian. Ethiopia is a country in eastern Africa . . . "
I stopped myself, checked on my iPhone, discovered she was right. Or at least not wrong. My grandmother did not like eating with her hands, and did not understand the role of the injera -- the spongy flatbread you use to scoop up the various dishes -- until about halfway through the meal. Lightbulb moment: "This a tortilla," she said. I said, "No, no, it's actually a sourdough pancake made with teff flour. . ."
She looked at me darkly. "I know. But it's like a tortilla." After that she ate with gusto. My grandmother is a pip. It is pliable, grayish, slightly damp, intensely sour, so good. I am determined to learn to make it, or something like it. To go with the injera, we had super-spicy ground meat, homemade cheese, chicken sauteed in butter, cabbage sauteed in butter, salad, all delicious. One order of baklava for dessert, which I would have skipped, but my grandmother insisted. I thought about how and what my grandmother eats. It's very simple: She eats everything, including wine, salad, and dessert, but everything in moderation, at mealtimes. It makes me think of the Michael Pollan maxim: Don't eat anything your great grandmother wouldn't recognize as food. That strikes me as the soundest of all dietary advice. The night after the Ethiopian dinner out, I made an Ethiopian dinner in. I made yataklete kilkil. Or, spiced vegetables. The recipe comes from the The Africa News Cookbook and you start by simmering butter with spices (ginger, turmeric, cardamom, etc. ), onions, and garlic for a full hour. Then you strain out the solids -- both dairy solids and bits of spice and onion -- so that you're left with pure golden butter imbued with a subtly exotic fragrance. It's beautiful. You'll want to dip a crust of bread in it, but try to resist. Once you have your spiced butter, steam some cauliflower, broccoli, carrots, and potatoes, then saute them in 1/3 to 1/2 cup of the butter. Salt to taste. I served the yataklete kilkil with basmati rice and everyone loved it except maybe Owen, who didn't seem to eat much. Isabel had seconds. Again, I started thinking about the peculiarities of the American diet. How it's all or nothing, you're eating like a bird or you're eating like Orson Welles. When I hear the words "steamed vegetables" I wince, because I have only met steamed vegetables in their most austere, unbuttered, unseasoned, you're-on-a-diet form. If all steamed vegetables were sauteed in a little spiced butter, I might actually eat steamed vegetables more than once per decade and be a healthier person for it. Last night, I made Algerian spicy vegetable soup (chorba hamra), also from Africa News. I will have to write more about this soup later because I didn't really eat any so can't comment on its flavor. I just left the pot on the stove for my husband and went to meet a friend of a friend for a drink. There, in the Marinitas bar in downtown San Anselmo, I consumed so many tortilla chips that I didn't feel like eating vegetable soup when I got home at 8:30 p.m.
My grandmother never would have done that. First of all, she never would have left my grandfather to fend for himself with a pot of soup and two children while she went out for a drink. What kind of negligent wife does that? No comment. But second, and more germane to the subject of this blog, my grandmother never would have stuffed herself with tortilla chips then come home and eaten a Skinny Cow caramel cone washed down with a glass of wine while watching Breaking Bad and called it dinner. I like to think I have a healthy, traditional diet, but when I actually look at what I eat, that isn't quite the case. I like Zeni, but Cafe Rehoboth is even better! Cafe Rehoboth is now on my list! San Jose again, oh well. Flatbreads and Flavors has an injera recipe, and lots of other fantastic things as well. Jeffrey Alford and Naomi Duguid (sp?). But anyone who goes to Marinitas knows that the chips are IMPOSSIBLE to stop eating! tortilla chips have ruined many a dinner for me. breaking bad is another guilty pleasure. need to try ethiopian, will probably have to wait for a trip out of Texas to accomplish this. Your grandmother is what we would call around here "a pistol." She sounds great. I have searched and found one Ethiopian restaurant near here. Maybe I'll try it for lunch tomorrow! I just wanted to tell you I love your blog! I discovered it while travelling this summer. I read an excerpt of your upcoming book in an air line magazine and looked up your blog as soon as I could. I work in a small, independent book store in Winona, MN and we are having a dinner event for the cookbook Plenty by Yotam Ottolenghi and wondered if he is on your list. It is beautiful and promising. Maybe you could test it for us! We have pre-ordered your book and I am looking forward to it's release. Thanks for your blog...it is a joy. That yataklete kilkil looks so good! I think you grandmother is proof positive that all of these fad diets and "eating plans" are bunk -moderation is the way to go. She sounds like a most lovely woman and its obvious how much you treasure her. Just curious, what would she think about all of your book clubs "inflammatory" foods? You'll probably never live up to your grandmother;s perceived standards, but then she probably didn't either. You'll probably never live up to your grandmother's perceived standards, but then she most likely didn't either. I love knowing what your family approves and does not approve. I'm wondering what your sister cooks. Please post the recipe for injera when you find one you like, i really want to try making it. Also, are you doing a book tour? If you are, be sure to come down to Orange County, CA. I'd love to meet you. I'd be happy to take you out for food even! Silver Gold Bull is your trusted precious metals dealer. You will be provided with bargain, live pricing and they will make sure your precious metals arrives to your door discreetly and securely. Would you want her promoting your book?